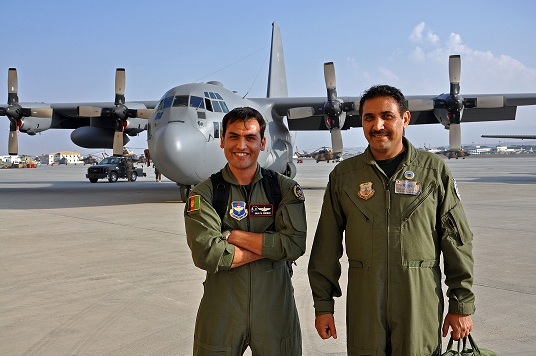 The Afghan air force received its first two C-130s from the U.S. Air Force on Wednesday, according to NATO Air Training Command-Afghanistan. Ultimately, the Afghans will receive four of the aircraft. The cargo aircraft are meant to replace the 16 C-27A cargo aircraft that the Afghans lost when the U.S. Air Force decided not to renew the contract with Alenia Aermacchi North America for not being able to provide enough flyable planes. Two Afghan pilots have been trained in the U.S. so far and another two are in the training pipeline, according to a NATO news release. Flight engineers and loadmasters are scheduled to begin training shortly. After the ceremony, one of the C-130s conducted a low-level flyover, the news release says. Later, 1st Lt. Khial Shinwari, one of the first Afghan C-130 pilots, opened the hatch and waved the Afghan flag as the plane came to a stop. Weldone Afghan air force. Keep it up. We are very happy on your great achievement. Dear sir, I have served for 26 years in Pakistan air force in which 19 years as a C-130 loadmaster / loadmaster instructor. on C-130 aircraft.I have vast experience on Aero medical evacuation,para trooping,para drop,low level tactical and all type of missions including dangerous cargo/ammunition’s on C-130 aircraft.I have vast experience of administration,passenger handling, baggage handling,VIP / VVIP handling and protocol duties.I am a qualified loadmaster instructor and has extensive instructional experience in transport conversion school Pakistan air force. Weldone Afghan air force. Keep it up. We are very happy on your great achievement. I want to join Afghan air force as a C-130 aircraft loadmaster / loadmaster instructor. Dear sir, I have served for 26 years in Pakistan air force in which 19 years as a C-130 loadmaster / loadmaster instructor. I have flown 4150 flying hours and has got flying caregory “A” on C-130 aircraft.I have vast experience on Aero medical evacuation,para trooping,para drop,low level tactical and all type of missions including dangerous cargo/ammunition’s on C-130 aircraft.I have vast experience of administration,passenger handling, baggage handling,VIP / VVIP handling and protocol duties.I am a qualified loadmaster instructor and has extensive instructional experience in transport conversion school Pakistan air force. You’d think they could get Col Pacha’s name right. It’s Aimal, not Almal.